Sunrise recently took to its blog to announce the addition of cross-functionality between its calendar app and to-do app Wunderlist. Included in the update are several new features that, while small, will be appreciated by those that use both apps. First, it’s possible to create Wunderlists tasks while in Sunrise. To do so, create a new event in Sunrise and choose Wunderlist as the calendar. Once created, the task will appear in Wunderlist, as well. Additionally, due dates in Wunderlist can be changed through Sunrise by simply dragging and dropping a task within the calendar. Lastly, checking off a task within Wunderlist will also make a checkmark show up in Sunrise next to that task. To enable the functionality, go to the setting menu within Sunrise, select “Add Account”, find Wunderlist among all the other apps that can be linked to Sunrise and enter your login credentials. That the two apps are able to work together like this is thanks to the new Public API Wunderlist released last week. The API allows other apps to communicate with Wunderlist and leverage some of its features. Apps that can already take advantage of this functionality include Slack, One Note and HipChat. This is the second update to Sunrise in as many weeks. 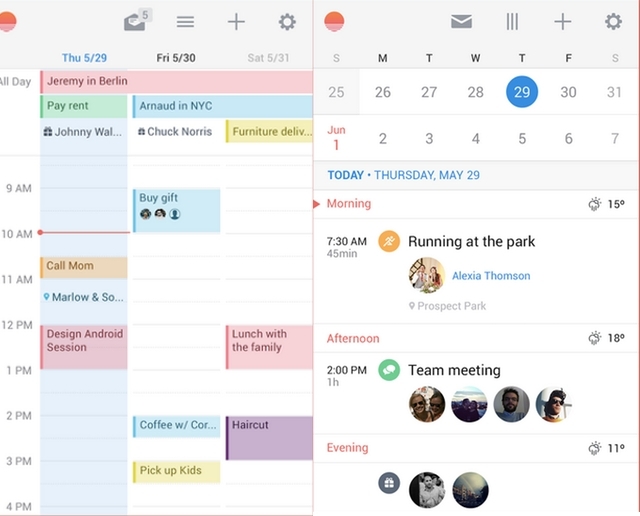 Last week, the company, which was recently acquired by Microsoft, released a third-party keyboard for iOS and Android called Meet that allows users to pull up their calendar while they’re in another app. Grab Sunrise on the App Store or Google Play. Wunderlist, likewise, can be downloaded from the App Store and on Google Play.